The $6 pizza special at Cleo's in West Town can't be beat. CHICAGO — Chicago summers are great for the thrifty among us. Today's things to do outside are all free or very cheap. Save those pennies to go on vacation in February. 1. You're Killing Me, Smalls: "The Sandlot" plays in Wicker Park tonight. Bring a blanket and get ready to hear a chorus of voices around you quoting the '90s classic. Free. Starts at 8:30 p.m. in Wicker Park, 1425 N. Damen Ave.
2. Hang With The Cool Kids: Head to Logan Square's skate park for "Night Out: DJ in the Parks" hosted by the Chicago Park District. Kids from 13 to 18 will skate while DJ Nick spins. Free. Starts at 6:30 p.m. at Logan Blvd. Skate Park, 2430 W. Logan Blvd. 3. Get Soulful on the South Side: Mike Dangeroux & Soulsation show off the many faces of American soul music. Bring a blanket, a beverage and maybe dance a little. Free. Starts at 6 p.m. in Grand Crossing Park, 7655 S. Ingleside Ave.
4. 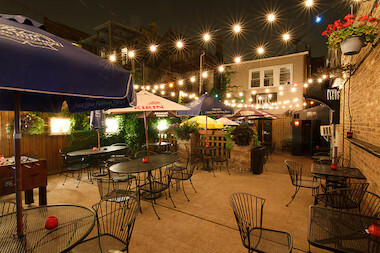 Eat Cheap, Delicious Pizza: Head to Cleo's in West Town and snag a $6 pizza on the patio. The 14-inch buffalo chicken and goat cheese/spinach are our faves. They also have $13 domestic buckets and $5 bombs if you're feeling cray. Pizza special good from noon-1 a.m. Cleo's, 1935 W. Chicago Ave.
5. Catch a Comedy Show: The Neo-Futurists take their famous show "Too Much Light Makes the Baby Go Blind" outdoors Thursday. They'll perform 30 plays in 60 minutes at Dvorak Park in Pilsen. Free. Starts at 7 p.m. 1119 W. Cullerton St.